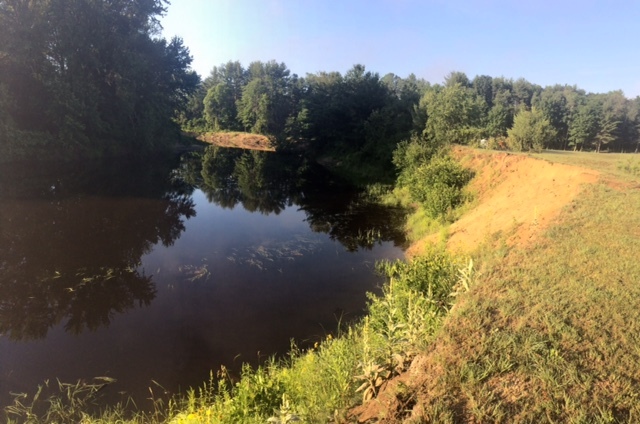 When it comes to the most beautiful places we have seen in our travels, there is little that can compare to an early July morning in verdant New Hampshire. It was one of the things I loved most about my decades living in the Granite State and it is shear indulgence to be able to selectively return when the climate here outdoes itself feeding the soul. We had booked a full four weeks at Ashuelot River Campground for our summer address and under the caring attention of Chuck and Laura, we are thoroughly enjoying our seasonal home. The most wonderful part of our time in New Hampshire is the reunions with our family members. We arrived in mid-June and one of our first was the occasion of an early birthday reunion for my Mom, who is 95 years old. 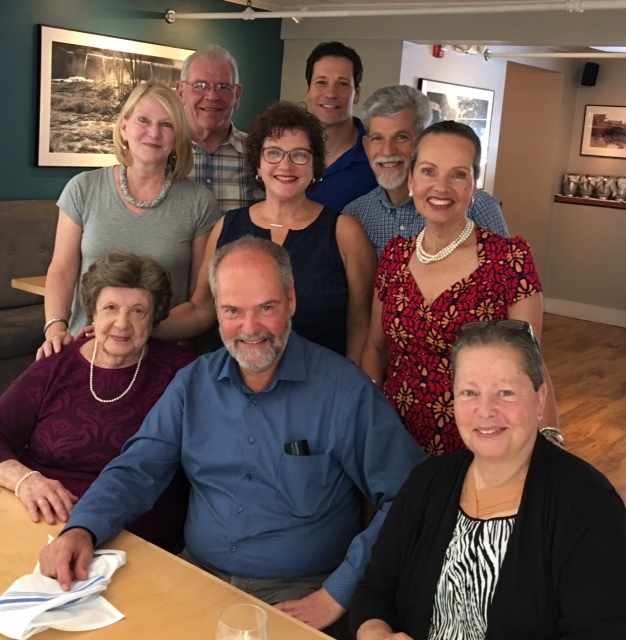 All five of us “kids” (and spouses) were able to spend a varying amount of time together over several days and on Saturday and Mom treated us to a wonderful luncheon celebration. This has become a bit of a tradition for us now and lunch is followed by desserts at Mom’s, made by my amazing sister. We missed our sister-in-law Vivi, who didn’t come from Germany with my brother but hopefully, will next year. Family reunion celebrating my Mom’s 95th birthday. She looks regal in her purple sweater and best pearls. From dinners with Peter’s sister, his children and their families, and discovering how we are continuously astonished at how much the grandchildren have grown, there never seems to be enough time when we are here. We have become really adept at just basking in the present moment as much as we can when the emotions of loving and missing these dear people wash over us. We’ve slipped in reunions with some personal friends as well and savor the conversations that distill our respective lives since the last visit. One of the requirements of life on the road, is scheduling visits to the health professionals who keep our various structural support systems in good working order. Many, like Peter’s orthopedic surgeon and our shared primary care physician, have become friends, and some loyal blog readers, so to be face to face with them is a happy experience. 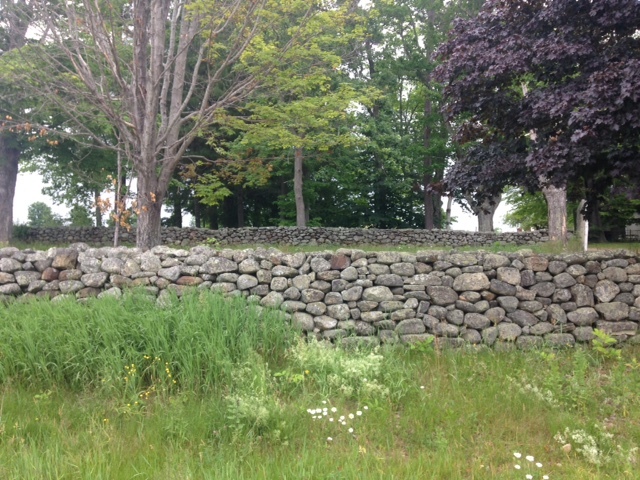 Uniquely New England, the stone walls of Canterbury Village are dry laid using native field stone. Our interest in Koreshan State Park continues to feed much of our trip planning this summer. The Petri dish that was the religious-utopian fervor of the 19th century had its origins in the northeast. Cyrus Teed, the founder of the Koreshan Unity Settlement, was from New York and as he was refining the vision for his utopian community, he studied the Shakers and had joined their community in West Lebanon, New York in 1892. We decided to do some additional research on the Shakers, first visiting the museum honoring their settlement in Canterbury, New Hampshire. Canterbury Shaker Village was established in 1792 when followers of founder Mother Ann Lee formed their seventh community in Canterbury and it remained prominent for 200 years. The Village has operated exclusively as a museum since 1992 when the last Shaker sister in residence, Ethel Hudson, died. While visiting Canterbury, we met a tour guide who shared an interesting detail with us when we told him of our volunteering time at Koreshan Unity Settlement. He began to talk about the Koreshan founder, Teed, and told us that there is a record of an initial set of conversations between Teed and the Shakers in New York about an affiliation of the two religious-utopian communities, who shared many of the same theologies. Koreshan Unity Settlement is the cover story of the October 2017 issue of this scholarly quarterly. The information is held in the special collections at Hamilton College in Clinton, New York, which houses primary and secondary source material concerning the history of American Communal Societies, of which Koreshan Unity Settlement was one. This was new information to us and we have now decided to make a visit to the collection when heading west in late July. 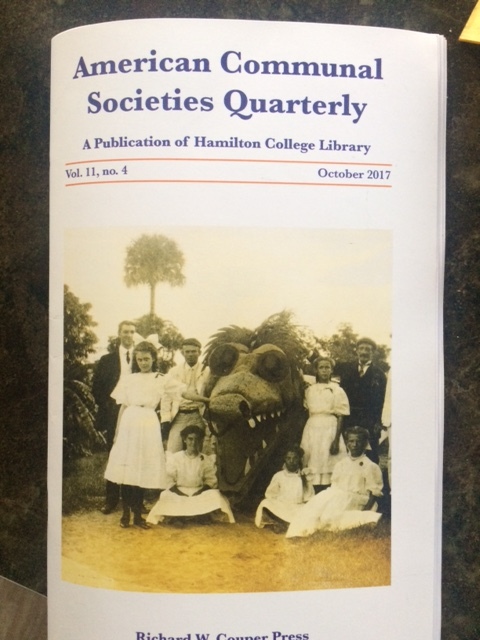 After checking the online collection at Hamilton College, I discovered that the Koreshan Unity Settlement was the editorial theme, and cover, of the October 2017 issue of the quarterly publication issued by the Richard Couper Press, which we have now received and completely devoured. This is very exciting stuff for us Koreshan groupies! Airstream theme dominates this IPA from Wachusett Brewery. Last week Peter and I enjoyed lunch at the Wachusett Brewery where our son-in-law works. I want to give a shout-out to the place where they use an Airstream for their tasting area and then continue the theme to one of their brands. 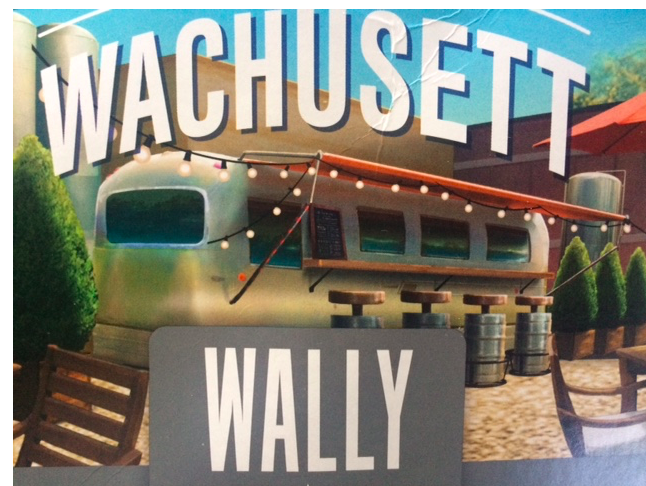 Wally is one of their most popular brews and it’s named after Airstream founder, Wally Byam. If you every come across the brand, be sure to pick it up and give it a try. It’s darn tasty and for the time you’re enjoying it, you’ll get to experience a bit of the aluminum beauty of our pilgrimage to here home, T2. And finally, thank you to all of you loyal followers of our blog who have written wondering where we are and how we are. All is well. Our trip north from Georgia included a stop to visit family over Memorial Day weekend in North Carolina, and a surprise find of traditional American music in the Blue Ridge Mountains of Virginia where we spent one remarkable evening at the Floyd Country Store, in Floyd, Virginia. Janet Turner and friends at the Friday night Jamboree. The townspeople show up on Friday’s for a series of musical performances and the locals come in and dance the traditional Appalachian flatfooting, the origin of contemporary clog dancing and a relative of Irish danceflat. 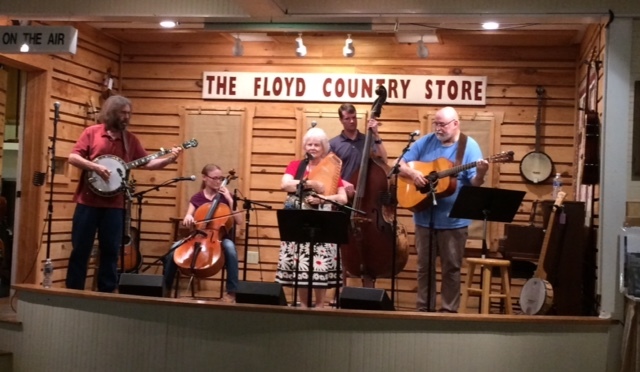 If you are ever anywhere near Floyd on a Friday night, bring along $5 to get a seat and enjoy hours of remarkable music and the hospitality of the townspeople. We are already planning a return visit to the glorious mountains. 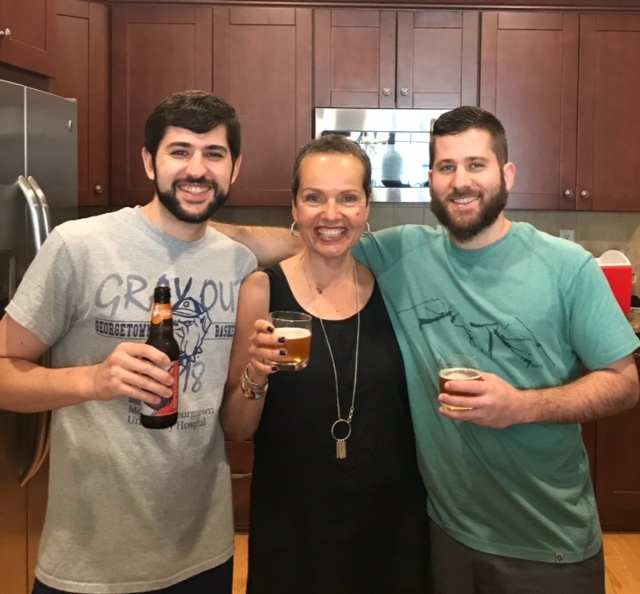 And so I close this July post with this picture with my two great looking nephews taken during our Independence Day reunion in Connecticut. Cheers to all of our friends across this wonderful country of ours and happy 4th of July. Peter and Liz are spending four weeks in New Hampshire, reuniting with family and friends (and allegedly cleaning some more stuff out of the storage area) while living in their Airstream, T2. This entry was posted in Uncategorized and tagged Airstream, Ashuelot River Campground, Canterbury Village, Couper Press, Floyd Country Store, Hamilton College, Shakers, Wachusett Brewery by lizbrown489. Bookmark the permalink. Nice picture of the boys – men, actually ! Lovely post. Happy Summer to you. When you are at Hamilton, you are very close to another fascinating Community at the Oneida Mansion House. We have taken the tour every year and always learn something new.